"I wanted a perfect ending. without knowing what's going to happen next." My dad bought himself a new scooter - a GO GO - last week. Watching him drive around the house, running into walls and doorways reminds me of taking driver's ed in summer school back in 1968. I'm not sure how I ever took what I learned there and managed to pass the test to get my license. I never did master the art of driving in the simulator. After my first turn behind the wheel on backing up day, I don't recall that any orange cones were left standing. Dad is pretty good at getting around, he just cuts his corners a little close! We went out this morning, which meant I had to take the GO GO apart and put it back together 4 times. It's not hard to do, but the pieces are kind of heavy. I've got putting the thing into the trunk of his car down pat. In doing so I've moved up a notch or two in my Dad's approval rating. In his mind scooter represents something mechanical. Dad has always thought of me as "mechanically challenged." He seems to be impressed at my scooter assembly skills. As I was unloading the pet supplies from the back seat of the car, Dad drove himself out into the driveway. I thought he was simply making a U-turn so I didn't pay him much attention. The next time I looked up, he was lying in the yard with the scooter almost on top of him. Egads! I guess the wheels caught on the rise from the cement driveway to the soft grass and over he went. You know how a kid who is just learning to ride a bike without training wheels looks after his first fall. Kind of wobbly getting back up. Well a 92 year old man with not too much strength in either his arms or legs trying to haul himself up off the ground is even sadder to watch. I stood by knowing my I'd get my hands smacked if I tried to help him up. My job in times like these is pretty much to keep my mouth shut and stand by looking concerned. In my head I'm not just an on-looker, I'm really a woman with super powers and if need be, I can lift the man or the cart with way more than my ordinary strength. It is a good thing that I have not yet been called on to do this kind of heavy lifting. Dad's been having more trouble swallowing. At first it was liquids that didn't want to go down, but it's beginning to happen more with solid foods. The hospice nurse explained to me that it could be the natural progression of his disease, or aging process. I know from experience that lack of swallowing abilities leads to two things - a) choking hazards and b)inability to eat. Both are reasons to think that he is in a state of decline. The doctor did not come right out and say it but I know that this is not a good sign. What I'm not sure about is what dad thinks. Does he realize that if he can't swallow food that he will have to choose between a feeding tube or no food. He has said on many an occasion that he "is ready to go" but when it comes to making the decision for a feeding tube, will he still feel that way? My guess is that it will take a few months to get to that point. He doesn't eat a whole lot now. I suspect it will continue to drop off. Since getting the scooter he no longer even walks the length of the house, so his other muscles are going to weaken also. The good news is we are getting along better. His animosity towards Sweetie has lessened dramatically. They don't appear to be so angry at each other. Naturally if the world around me is okay, then I'm okay! For years before my mother passed away, Dad and I knew that she could go at any time. Yet we weren't prepared on the day she died for it to happen. I've known since the day Dad opted out of treatment and into hospice that his days would be numbered. He's had many more than he expected. Knowing it and accepting it are two different things. My job now is to help make him comfortable and savor the time we have left together. Easier said than done? Yeh, probably, but it's what I signed up for, and what I am called to do. This takes me back to my own Dad Mary...watching the decline is difficult and mine had always been a real abuser so it was very hard on me. Fortunately, I stayed within a place of 'God's Love' and refused to let it get to me, although after he passed and I was going through his things I really broke down...all I ever wanted was his unconditional love but never received it? 'Maybe he doesn't know how to and maybe he isn't capable of it'...love him anway. It sure made me stop and take it all in. And I really tried to employ that. I wrap you lovingly in my Sister arms and send you Love...and strength for the times ahead. It is good to hear you all are getting along better...surrendering can be very powerful, as I am sure you well know. Wishing for you the abundant love that will continue to carry you through with your Dad. It is beautiful how you allow him his dignity rather than swooping in when he takes a spill. He is so lucky to have you -- and your love and patience. Glad to hear things are more smooth for you all! 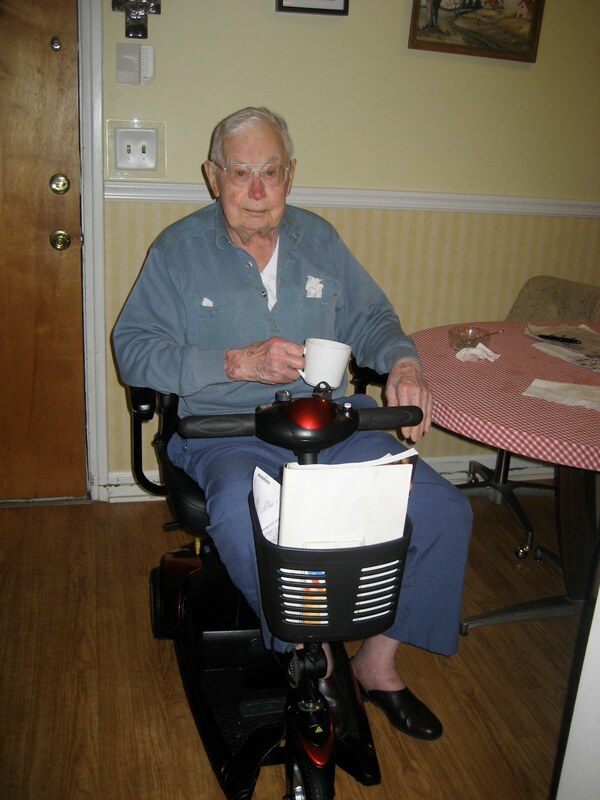 And thankful that a silly thing like a scooter can give an old guy such a boost!